← Random Panel: THAT's the sound of destruction?! Wow. At first I was afraid, I was petrified. I kept thinking I could never live without him by my side. But you know, he's black, from outer space, I opened up my "Who's Who" and saw that stupid look upon his face. Then I kept looking and saw that apparently I was wrong last week and the Legion of Super-Heroes is at least a pants-free club. Maybe the requirement is that you also have to wear chains of some sort on your chest, I don't know, but Tyroc is nonetheless really working this outfit, girl! It takes a pretty confident guy to wear a white leather sleeveless vest slit to the navel with a popped ear-high giant collar. Combine that with incredibly snug leather whitie-tighties and Peter Pan slippers, not to mention sweatbands and a pose that can only be described as sassy and you've got yourself a dulcet-toned crooner whose voice can not only teleport himself, stop energy blasts, and propel himself through the air, but also make you get down with your funky self! As for the gigantic metal discs joined by chains across that rock-hard chest, what can I say? It's like Thor ran smack dab into the Dazzler and produced this cocky young love child from the future. One thing you can say for sure about Tyroc, though -- with an outfit like that, he will survive. Heyay hey. Please note that any null-content comments like “First” or “YEAH” will be deleted with extreme prejudice. Tyroc…the lesser-known member of The Village People. 1. No mention of the words BLACK or DARK in his name. 2. He isn’t drawn by Rob Liefeld. Hmm…his alter ego reads Troy Stewart. Could he be a descendant of John Stewart, Green Lantern? I’m hoping he’s not, John doesn’t need that black sheep in the family (…no pun intended.)! I want to say he came along well before John Stewart took over as Earth’s GL, but it might have worked the other way — when they decided on a replacement they saw this guy and decided to “retcon” it in. Odds are though that it is just a fairly common name, and a coincidence. The island Tyroc is from is a dimension and time hopper to boot, making the causal chain even more kinked and unlikely. And it frightens me that I know that. 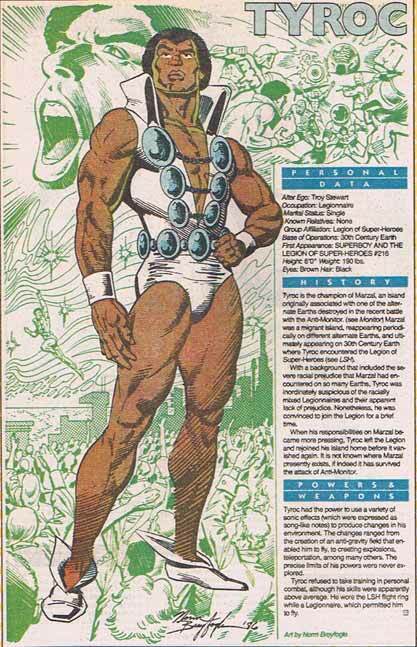 I actually had the appearance of Tyroc issue of the Legion as a kid, I loved that group. Jeff – the next caption contest I win will see you transforming this guy into a Liefield-esque parody. Jack, my fingers are crossed for your victory. After watching the linked music vid, it’s clear that there’s one more thing Tyroc needs to make his ensemble complete: roller skates. I particularly love the “brothah shake” he gives Karate Kid in the 4th scan. Even in the 31st century, a brothah’s gotta have soul. And huge sideburns. That’s critical. That’s the gayest thing I’ve ever seen. Is that a cup or he just happy to see me? That is scary! I’d be very afraid if i saw this guy walking towards me.